This is the message that the cast and crew of “Indigo Blue” hope their audience will take away with them. From Thurs., Dec. 12, through Sunday, Dec. 15, Walltown Children’s Theatre – a Durham-based nonprofit organization that offers acting, singing and dance classes to under-served youth in the Walltown community – will be presenting “Indigo Blue,” a musical based on “The Pied Piper of Hamelin.” Written by Durham playwright Howard Craft, “Indigo Blue” is set to take place at PSI Theater on 120 Morris St. in Durham for a total of eight performances. In the original story of “Pied Piper,” several children disappear from the town of Hamelin after the Pied Piper is denied payment for luring away rats from the city. Director Karen Dacons-Brock says the musical differs from the fairytale because it ends on a hopeful, happy note and emphasizes the idea that you can do anything you set your mind to. Actor Max Rose (most left), who plays Bugsby Bramblethorn in “Indigo Blue,” rehearses a scene with Journi Grice, 6; Chelsea Rose, 10; and Jaxon Hardin, 8 (left to right). “If you have something that you see that you think needs to be done, jump in there and find your resources and go do it. That’s what the little girl, Mariposa, does in the play. She’s faced with huge challenges after the Pied Piper has taken all the children away. She can’t accept that her little brother is gone and all the little children are gone,” says Dacons-Brock, who also collaborated with Walltown Children’s Theater on the “Durham Nutcracker” last year. Cynthia Penn, WCT’s founding artistic director, says she cried the first time she read the script, owing to Craft’s descriptive language and an element of surprise. She says the heroes in the play aren’t just for the audience to enjoy and identify with, but also the cast members, who have been studying their character roles since late August. 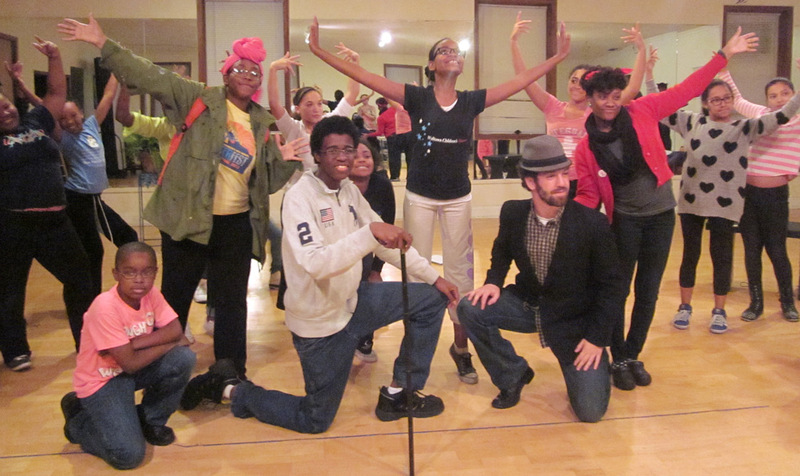 The cast closes their “Indigo Blue” rehearsal on Nov. 22 with the ending theme song, “Never Give Up on Hope.” Lenora Zenzalai Helm composed the music for the show, while song lyrics were written by Durham playwright Howard Craft, who also wrote the play’s script. “The kids have the opportunity to be in a collaborative experience and thrive in supporting one another. There’s nothing better than learning that at a young age,” Penn says. An “Indigo Blue” VIP Reception, to be held on Dec. 15, will serve as a fundraiser to help pay for the musical as well as future WCT performing arts projects. Audience members who have prepaid tickets will get to meet the show’s cast and crew and receive several perks, including reserved seating for that day’s performance. The musical features more than 25 characters, which are played by actors and actresses ranging from age 6 to adulthood. Most of them are either current or former students at Walltown Children’s Theatre. Some actors have already graduated from college and work one or two jobs, but they still manage to find time to be a part of WCT. 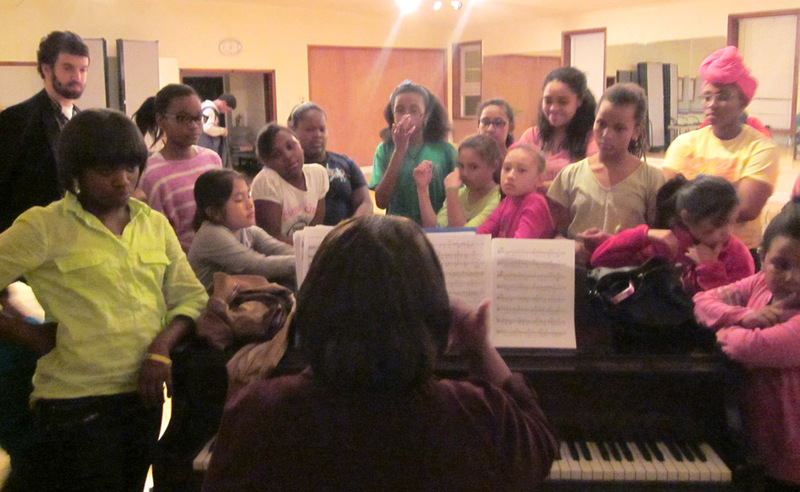 “Indigo Blue” actors and actresses gather round the piano as WCT’s vocal coach Paula Nunn harmonizes their voices together during rehearsal on Nov. 22. 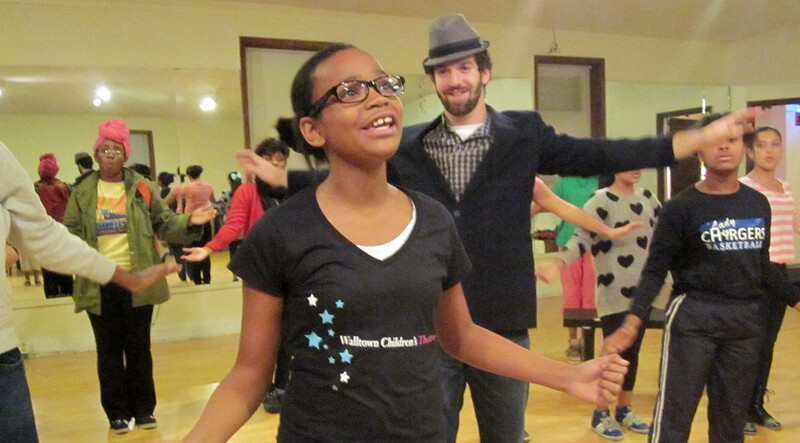 Actress Mesha Mumford, 11, has been involved with the children’s theater since early August when she attended their summer acting camp. “Everyone was really nice, and I learned a lot about acting and dancing and how it’s not just about the movements. It’s about how you feel,” says Mesha, a student at Cary Academy. “Acting is a chance to explore and be somebody else.” On the opening night of “Indigo Blue,” she will finally get to showcase her acting, dancing and singing skills. For Mesha, the greatest challenge about performing in “Indigo Blue” has been adopting the role of her character, Big Chief. The cast is comprised of actors and actresses who have different levels of experience, so the production process has also been a training period for the theater crew, Dacons-Brock says. As director, she strives to balance those levels of experience and help her students maximize their potential on stage. 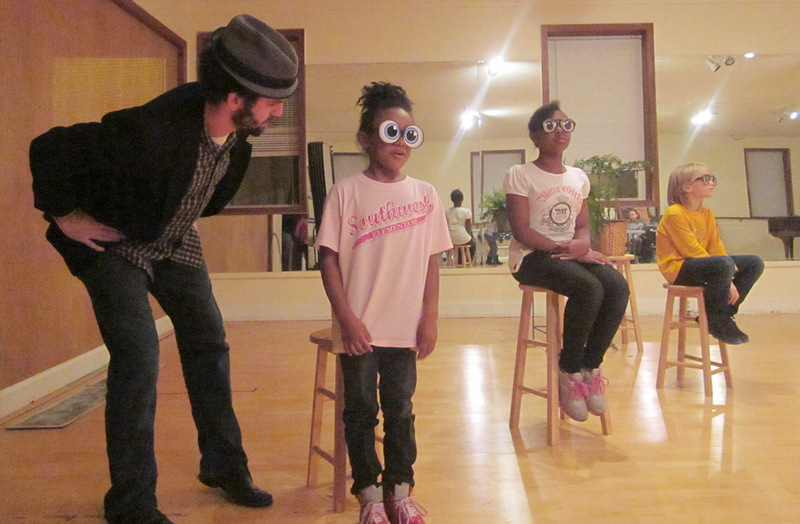 For some kids, the performing arts is completely new territory. 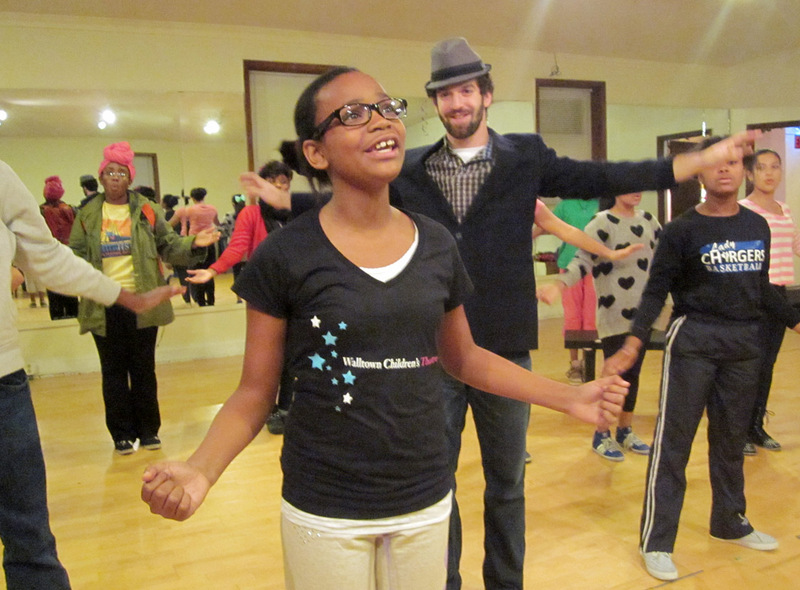 Others, like Mesha, have acted in a couple plays but never had a major role until now. There are also students who have acted for years, including Jean Christian Barry, a junior at Durham School of the Arts whose chosen pathway concentration is choral music. Barry has been a student at Walltown Children’s Theatre since he was 6 years old. Now at the age of 16, Barry says being a part of “Indigo Blue” has encouraged him to get outside of his comfort zone. “I’m playing an older character, so it’s a new experience for me as an actor,” says Barry, who plays the role of Owen Theodore Crumb, a 70-year-old ex-wrestler, and uses a walking cane as a prop. Walltown Children’s Theatre will present “Indigo Blue” Dec. 12-15 at the Durham Arts Council’s PSI Theater on 120 Morris St. in Durham, N.C. The showtimes are as follows: Thursday, Dec. 12 at 4:30 p.m. and 7 p.m.; Friday, Dec. 13 at 10 a.m., 12:30 p.m., and 7 p.m.; Saturday, Dec. 14 at 2 p.m. and 5 p.m.; and Sunday, Dec. 15 at 2 p.m. and 4 p.m. Tickets can be purchased on the WCT website. This entry was posted in Arts and tagged Walltown Children's Theatre. Bookmark the permalink. Great article Wendy, Can we get a few copies?